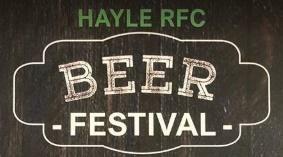 Hayle Rugby Club is to host its first beer festival on Saturday April 13, featuring four Cornish and six national brews. It all gets under way at noon. The Cornish beers have been sourced from Black Flag, Tintagel, Penzance and Treen’s breweries. From further afield come ales from Titanic, Black Edge, Bank Top, Totally Brewed, Marble and Kinver. There will also be four real ciders available, from Celtic Marches, as well as a hog roast, all to a background of rugby during the daytime and live music in the evening. It all takes place in Hayle RFC’s 250-capacity function room, but there’s a comfortable, refurbished lounge bar, too, with BT and Sky sports, open to members and non-members, families and well-behaved dogs. Club steward, Sharon Wicks, said: “We never sold real ales before our recent lounge bar refurbishment, and due to the popularity, we are delighted to be in a position to host the festival, with a range of ales and ciders on offer, and all to be enjoyed alongside rugby, live music and a hog roast. The club is determined to make the venue not only a hub for sports fans, but a centre for all sorts of community activity. If you’re club or group is in need of a versatile space for regular meetings or a special event, get in touch with Sharon to find out more. Sharon said: “In addition to welcoming new trade in the lounge bar and function room, we are working in partnership with private businesses and voluntary sector organisations and are enjoying seeing, once again, Hayle RFC thriving at the heart of the community.” Hayle RFC would like to thank the beer festival sponsors: Camborne Joinery, Cornwall Stairs, Atlantic Pools, Cherry Trees Garden Services, Callighan Sol Ltd, Jago Skip Hire, CIB Lello Plant Hire, Rospeath Farm Organics, R S Jenkin & Son, The Cornish Oven, Roofing Complete South West, Richards Farm Shop, and Treyarnon Bay Caravan Park.